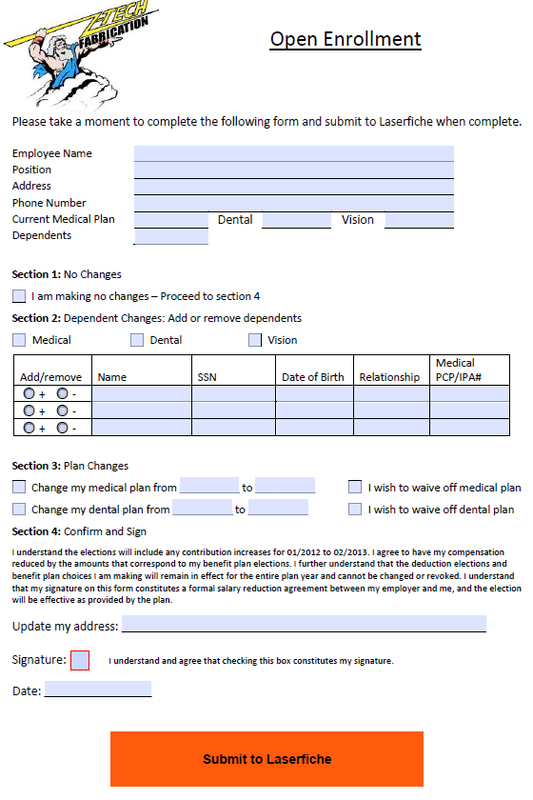 Use the scripts below, in conjunction with Laserfiche Import Agent, to send PDF forms directly into Laserfiche with the click of a button and streamline business processes such as open enrollment. Since Adobe does not allow you to automatically save the PDF at a specific location through a button, you need to configure this button with a two-part script. For the purposes of this example, we are saving all the files in a folder on our hard drive called C:\pdfsubmission. You will have to modify the scripts to reference your preferred storage location. Note: In this example we use Adobe Acrobat X. This process should also work with other versions of Adobe Acrobat. First you need to add a Submit Button to your form. Under Actions, make sure to select Mouse Up as the Trigger. //This script has the action (Save) and location where it will be saved. // Ensure path has trailing "/"
In order for this button to work correctly for users who will be filling out this form with Adobe Acrobat Reader (not Adobe Acrobat), you have to save the entire PDF with the Extended Reader Functionality. To do this, navigate to the File menu – Save-As – Reader Extended PDF – Enable Additional Features. 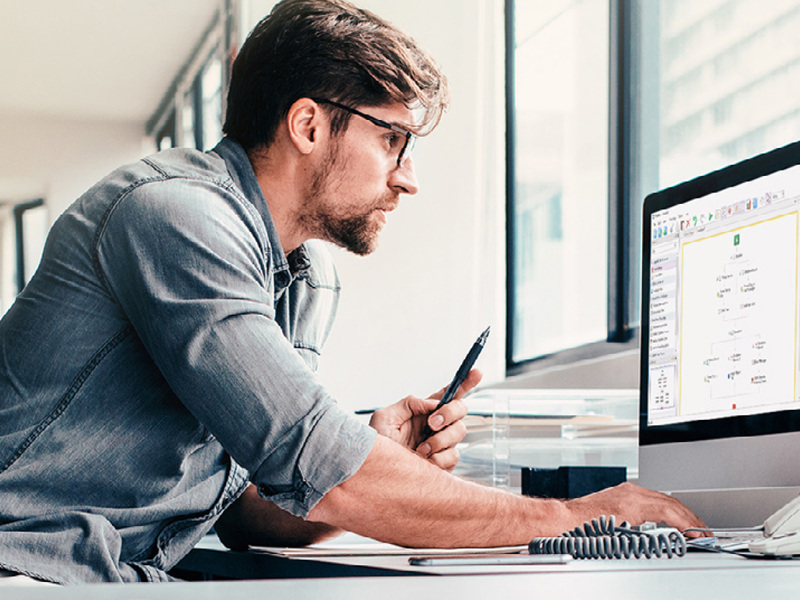 Once the PDF has been saved with Extended Reader Functionality, you can configure Laserfiche Import Agent to automatically import files into Laserfiche from the network folder into which they were submitted. Laserfiche Import Agent is an optional tool for automatically retrieving files stored in a Windows folder and importing them into a Laserfiche repository. 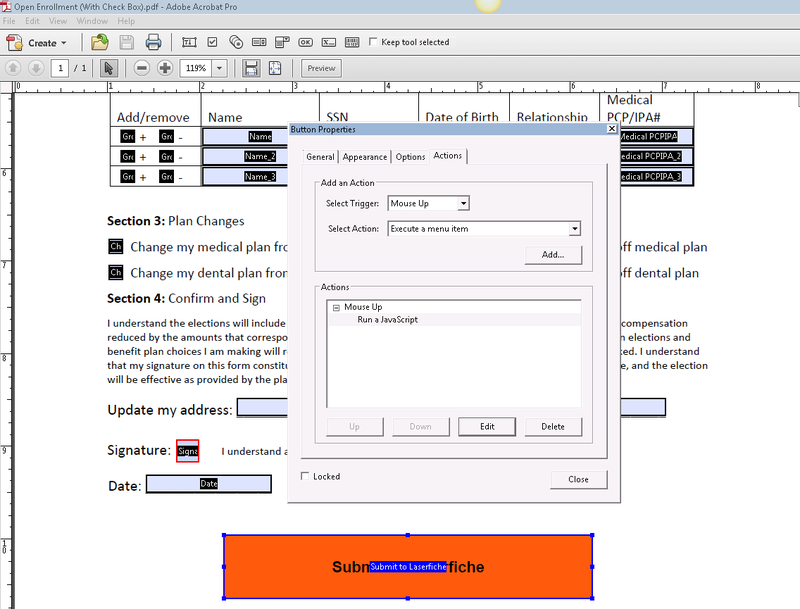 You can incorporate both the new PDF activities and the form with the custom button into your workflow. Z-Tech Fabrication Company would like to send out an Open Enrollment form to every employee. 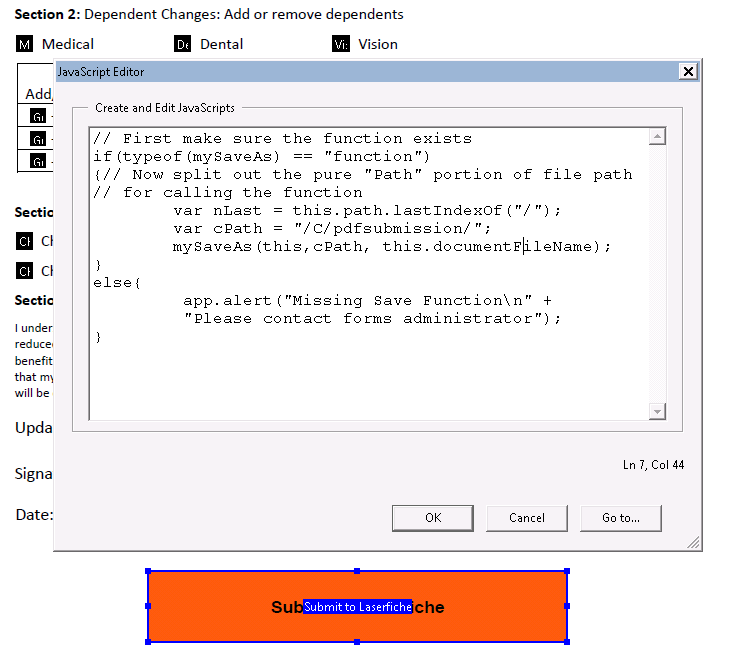 Z-Tech creates a form and adds a custom Submit to Laserfiche button using the scripts described above. In order to simplify this process and reduce errors associated with entering incorrect data, Z-Tech has designed a workflow that pre-fills certain fields in the PDF form with employee information stored inside a database, and then e-mails this partially completed form to each employee. Extracts the content of the form. Stores the original file in a Record Series. Stores the file shortcut in the specified employee’s folder. Updates the employee database with the new data from the form. Notifies the HR Manager by email that the form has been submitted and the database updated. 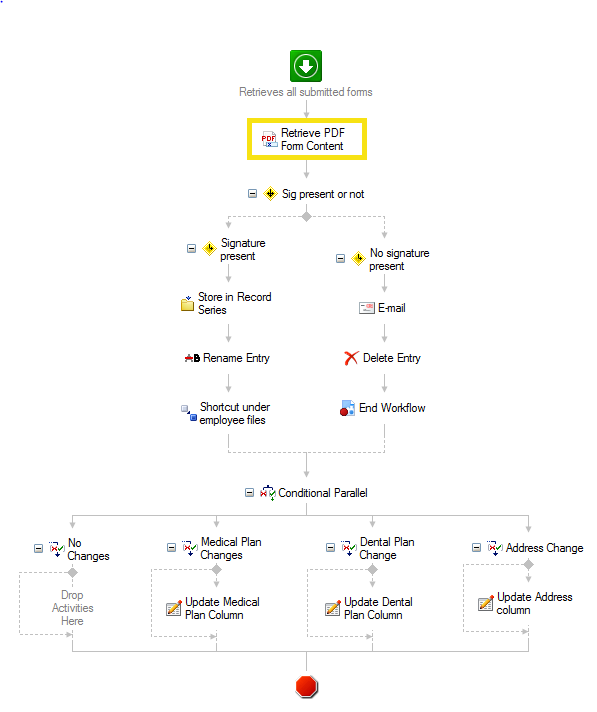 If an employee didn’t sign the form before submitting, Workflow sends the form back to the employee to sign and re-submit. All of the files associated with this process, including the code and sample workflows can be downloaded here.